Once a prevalent adjunct to butcher shops, community meat storage spaces in upstate New York are supporting farmers and making meat more affordable. Look no further than the local food movement to find history repeating itself. Food preservation, root cellars, seed saving, and other “old-fashioned” practices are being reinvigorated all over the country, proving that good ideas have lasting power. Now the meat locker is making a comeback, thawing out after a long, deep freeze since its heyday in the 1940s. 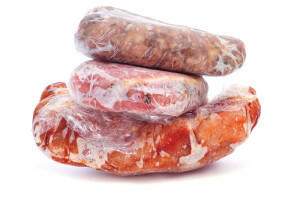 When frozen food was first introduced, home freezers were not yet prevalent and shoppers needed a place to store the frozen meat they bought. So butchers and grocers set up chilled rooms adjacent to their shops. These “meat lockers” were filled with individual bins—often complete with their own keys—that consumers rented and could visit whenever they needed to pick up their meat. Today, people who want to buy and store the quantities of meat that many farmers sell directly, through meat-buying clubs, or in community supported agriculture (CSA) meat shares, are in a similar bind. If they lack space for an extra freezer, or can’t afford one, they’re essentially unable to access the most affordable kind of local, pasture-raised meat there is—animals sold in bulk. In 2014, LeRoux and a handful of colleagues at Cornell Extension who run the Finger Lakes Meat Project launched what could be the nation’s first modern-day meat locker, in Ithaca, New York. In 2015, they launched a second meat locker, in nearby Corning. Already, Cornell Extension is receiving calls from food activists around the country who want to replicate this unique project in their communities. With a locker, the savings on bulk meat can be substantial: LeRoux calculates that Ithaca residents can save between $200 and $250 if they buy a frozen quarter of beef (about 100 lbs.) for between $600 and $650 from a local farm rather than buying those cuts individually from area stores. Freezerless foodies in the Finger Lakes region have flocked to the Ithaca locker. There is now a waiting list there (although the Corning locker still has some open bins) and Cornell Extension is considering turning ownership of the freezers over to renters, who would form a co-op. Currently, the lockers are a project of the Finger Lakes Meat Project, a Cornell Extension initiative that also includes Meat Suite, an online tool for consumers who want to find local bulk meat. The popularity of the meat lockers leads LeRoux to believe that food activists in other American cities and towns are likely to find success if they launch similar programs—even on a modest scale. “I don’t think most places would have trouble finding renters,” he says. However, LeRoux stresses that community education is essential. People need to know how a meat locker works, how to buy meat in bulk, and what the personal benefits are. While it cost $20,000 to buy and install each freezer in the Finger Lakes, they were built with funds from a U.S. Department of Agriculture (USDA) grant that also provided roughly $40,000 for Cornell Extension staff to hold workshops and engage in outreach. Meat lockers don’t just benefit consumers; they’re also a potential boon to livestock farmers. Although farmers make less money per pound on the sale of quarter, half, and whole animals, they save a great deal of time and labor by selling their meat all at once. Jake Delisle, a 30-year-old beginning farmer in Ithaca, raised 18 pigs on pasture last year at his Roaming Root Farm. His meat sells for between $7.50 a pound (for sausage) and $10.50 a pound (for smoked ham steak). He had several customers who wouldn’t have been able to afford his pork in the quantities they bought last year without access to the meat locker. Delisle also rented a handful of locker bins himself and used them to store part of his inventory. Cornell Extension has since banned farmers from renting bins—the project was designed for consumers—but Delisle was grandfathered in. He is grateful that he was able to access affordable freezer space as he was starting his farm. “If we want this local food movement to really go anywhere and feed people on a greater scale, we need these centralized co-op storage facilities, because people like me can’t afford industrial scale infrastructure,” Delisle says. In some states, particularly in the Midwest, small slaughtering facilities are often called meat lockers, but they don’t offer consumer rental facilities (some store game for hunters). The American Association of Meat Processors told Civil Eats it hadn’t heard of any other meat lockers like those in the Finger Lakes, and neither had the Niche Meat Processors Assistance Network, meaning that the New York lockers are probably unique. LeRoux likes to tell the story of Ithaca’s early communal meat locker, which operated in the 1940s at the dawn of the freezer age. It was called “Mother Zero” and, like the present-day locker, was located downtown and launched by Cornell to encourage people to buy frozen meat. Unlike today’s locker, Mother Zero was built to motivate consumers to transition to their own home freezer and encourage them to become part of the frozen food revolution. But this revolution eventually put communal meat lockers out of business—at least for a few decades. 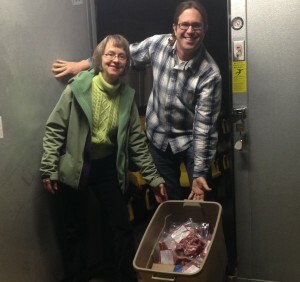 Photo of Matt LeRoux and a meat locker customer by Susannah Spero.